Idle clickers have been around for a while; they mostly consist of players grinding out simple actions in order to earn a particular resource, which can then be used to progress further in the game. Despite their apparent simplicity, they’re actually an addictive little format which has proved popular with players all over the world; it seems they’re the perfect minigame to keep your thumbs busy on a dull commute. If you take this tried-and-tested idle clicker format and infuse it with something new, chances are you’d have a smash hit game. Final Fortress – Idle Survival does just that, and does it extremely well; it’s free and out now on iOS and Android. Final Fortress pits you against a horde of hungry zombies, each desperate to get their undead rotting hands on you. It’s post-apocalypse, and it’s up to you to muster as many survivors as you can, construct said fortress, and defend your new home against the unrelenting waves of evil dead. It’s a pretty cool premise already, and when you add in the sumptuous, pitch-perfect graphics and design, you have a formidable game on your hands. 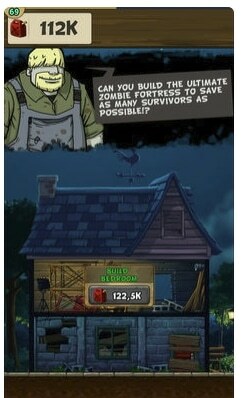 What sets this game apart from similar idle clickers is the way you do battle with the zombies. This is a new update the developers at Alley Labs have come up with, and it’s a smart one. You click to build your tower, but you must also ensure that each floor of your masterpiece is outfitted with appropriate weapons to repel the undead. These battle segments inject a lively bit of action into proceedings, and also adds a nice ‘ticking clock’ to your construction efforts; you’ll want to build your fortress as quick as possible to be in with the best chance of survival. This unique spin on the classic idle clicker format (strange that an app genre can now be referred to as ‘classic’ but there you go) makes Final Fortress – Idle Survival a hard one to put down. Fans of zombie films and TV shows will enjoy the bleak but quirky world the creative team dreamt up, while fans of idle clickers and action-adventurers will have a field day. Take up arms against the undead today at the App Store and Google Play!